As Emory hosts the "Indigenous Beauty" exhibit, art history students will get in-depth exposure to both the artwork and the experts who can help them understand and contextualize it. For the fall semester, the Art History 485 seminar taught by Rebecca Stone, professor of art history and faculty curator of Art of the Americas, focuses on "Indigenous Beauty." Students are learning about each of the represented regions, with specific concentration on selected works in the exhibit. In addition to conducting their own individual research and class presentations on items in the exhibit, they will have the opportunity to learn from guest scholars and engage directly with one of the artists. “We are delighted that all of the visiting art historians who are coming to lecture will also be meeting with Emory students in the class that Rebecca Stone has developed around the exhibition," says Elizabeth Hornor, the Marguerite Colville Ingram Director of Education at the Carlos Museum. "Renowned Santa Clara pueblo artist Tammy Garcia will introduce those same students to working with clay,” Hornor notes. A major exhibition of Native American artwork, “Indigenous Beauty: Masterworks of American Indian Art from the Diker Collection,” opens at the Michael C. Carlos Museum on Saturday, Oct. 10. The exhibit debuts at the Carlos Museum following showings in Seattle and Fort Worth, and will be on view through Jan. 3. It is described as providing rare access to many exquisite works from one of the most comprehensive and diverse collections of privately-owned Native American art. Some of the objects have never been seen before in public. Not confined to one or even a few regions, the exhibition of 118 masterworks presents objects draws from a variety of cultures of North American indigenous peoples. “When this exhibition, ‘Indigenous Beauty,’ was offered, we jumped at the chance to showcase so much more than we could on our own,” says Rebecca Stone, Emory's faculty curator of Art of the Americas, who as site curator is adapting the traveling exhibition to the venue here. “The high quality and the great diversity of the Diker collection make this the perfect show for Emory, as a great introduction to the artistry of indigenous people from all regions: the Arctic, Northwest Coast, California/Great Basin, the Southwest, the Plains, and the Eastern Woodlands," she explains. Stone describes how the entire third floor of the Carlos Museum is filled with the bright colors, intricate details and strong silhouettes of painted hides, beadwork, plant-fiber baskets, wooden bowls and masks, and other items. “There are shaman’s amulets and headdresses, an eight-foot wide cloth painted with the Battle of Little Big Horn, and two contemporary glass pieces, to mention just a few of the treasures that will be on view,” she says. Also included will be sculpture and sculptural objects, ancient ivories, masks, regalia, pottery and more. As the Carlos Museum hosts "Indigenous Beauty," the museum seeks to extend opportunities for learning through a variety of programs designed to complement the exhibition. • Gallery talk: On Wednesday, Oct. 14, at 7:30 p.m., Stone and Assistant Curator Laura Wingfield will lead visitors through the exhibition. Registration is required. 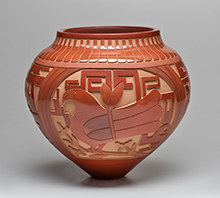 This jar by Tammy Garcia, regarded as the foremost Native American potter working today, is one of the 118 works included in "Indigenous Beauty." Garcia will present the Nix Mann Endowed Lecture at Emory on Oct. 18. • AntiquiTEA: These popular events, which feature tea and scones along with the presentations, will focus on "Indigenous Beauty" for the next two months. All are held at 4 p.m. in the Reception Hall of the Carlos Museum. On Thursday, Oct. 15, Wingfield will discuss the gun/war club, obtained and adapted from the Europeans, as both a work of art and a political statement for many Native American groups. On Thursday, Nov. 12, Stone provides perspective on the tension between viewing Native American objects as commodities, thus making them acceptable to display, or as containing spirits with roles secret to anyone but initiates. • Nix-Mann Endowed Lecture: This year's lecture features Tammy Garcia, regarded as one of the foremost Native American potters working today. It will be Sunday, Oct. 18, at 4 p.m. in the Carlos Museum Reception Hall. Garcia, who comes from a dynasty of female potters from the Santa Clara Pueblo in New Mexico, will discuss her work in line with her heritage and cultural identity as well as new avenues of artistic expression she has discovered in bronze and glass. • Cooking class: Cakes & Ale Chef Billy Allin will highlight the “Three Sisters,” known in many Native American cultures as corn, beans and squash, on Monday, Nov. 2, at 7:30 p.m. The chef will demonstrate his creative approach to tasty and healthy dishes using these staples of the Native American diet. Objects displayed in the "Indigenous Beauty" exhibit are not limited to one region of North America, so Carlos Museum curators also took a broad geographical view when planning lectures related to the exhibition. Four “Indigenous Beauty” lectures are scheduled. All will be at 7:30 p.m. in the Carlos Museum Reception Hall and all are free and open to the public. • “Trade and Transformation in American Indian Arts of Eastern North America”: David Penney, curator of the “Indigenous Beauty” exhibit, will speak on Tuesday, Oct. 20, examining innovative techniques and art styles in the 18th and early 19th centuries. Penney is also associate director of museum scholarship at the National Museum of the American Indian, part of the Smithsonian Institution in Washington, D.C.
• “The Plains Indians—Artists of Earth and Sky”: This lecture on Tuesday, Oct. 27, features Gaylord Torrence, senior curator of American Indian Art at the Nelson-Atkins Museum of Art in Kansas City, Mo., discussing the Plains artists’ wide range of utilitarian and ceremonial art from before European contact to today. • “The War the Slaveholders Won: Indian Removal and the State of Georgia”: On Tuesday, Nov. 10, Claudio Saunt, Richard B. Russell Professor in American History and associate director of the Institute of Native American Studies at the University of Georgia, explores the state’s central role in Indian Removal, when the United States expelled 100,000 people from the Southeast in the 1830s. • “Art and Ritual Process among Northern North Coast First Nations”: This lecture on Tuesday, Nov. 17, looks at visual arts forms of ceremonial attire such as masks and headdresses and the role and revitalization of clan art. Barbara Brotherton, curator of Native American Art at the Seattle Museum of Art, will focus on the northern Northwest Coast people of southeast Alaska and British Columbia. The Carlos Museum also seeks to use the traveling exhibit "Indigenous Beauty" to highlight ongoing scholarship on Native American culture and history underway in Georgia. Renowned scholars will discuss their community-driven research on Sunday, Nov. 1, at 2 p.m. in the Carlos Reception Hall. LeAnne Howe, Eidson Distinguished Professor in American Literature at the University of Georgia, will talk about duration, a concept she explores in her novels and her scholarship, from ways in which Southeastern Indians used it to physically shape the Southeast to ways in which it connects a Choctaw creation story to Atul Gawande’s work in health systems innovation. "My work suggests that duration is one of the core principles that has sustained Southeastern Indians long before our removal from these lands in the 1830s and beyond," Howe says. Jace Weaver, Franklin Professor of Native American Studies and the director of the Institute of Native American Studies at the University of Georgia, will discuss his new book, “The Red Atlantic: American Indigenes and the Making of the Modern World, 1000–1927,” and his ongoing community work with the Cherokee Nation. There will also be Carlos Reads book clubs for adults and teens. “Susan Power's ‘Sacred Wilderness’ and Deborah Miranda's “Bad Indians” both draw explicit attention to Native American art and artifacts, and they raise important questions regarding the treatment of those objects by individuals as well as institutions,” says Mandy Suhr-Sytsma, lecturer in the English department. Suhr-Sytsma, who is also director of the Emory Writing Center, and Levin Arnsberger, assistant director for academic support in Emory College, will lead the reading sessions. “We are thrilled to be able to draw on the rich faculty resources of Emory and of the Native American Studies program at the University of Georgia to further contextualize Native American culture through discussions of literature, the role of Georgia in the Indian Removal policies of the U.S. government, and other topics that should be of great interest," says Elizabeth Hornor, the Marguerite Colville Ingram Director of Education at the Carlos Museum. 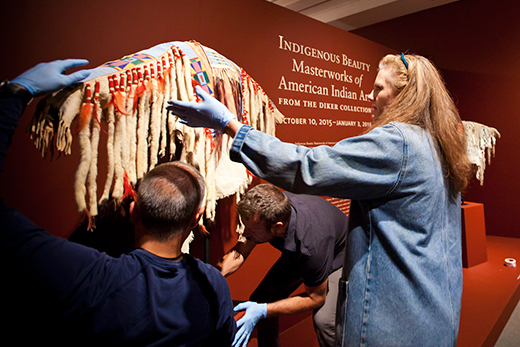 “Indigenous Beauty” is organized by the American Federation of Arts and made possible by the generosity of an anonymous donor, the JFM Foundation and Mrs. Donald Cox. Support from the Thalia N. Carlos and Chris M. Carlos Foundation and the Thalia and Michael C. Carlos Foundation has made possible the exhibition in Atlanta.